I need to do more storecupbioard based cooking. The results never fail to please and it’s always a good feeling to know you’re saving money. I guess I do it less than I used to because I’m spoiled by the area in which I live. Everything’s available within a five minute walk unless, of course, it’s Sunday. Last Sunday I wandered into Waitrose on my way home and found a pack of duck liver in the bargain bin. At £1.30, I couldn’t say no. Although I’d never cooked duck liver before, I thought it fair to assume it tasted similar to chicken liver and that’s the basis I worked on when I made this. Lurking in my fridge was a bunch of parsley and a bag of rocket which, combined with some walnuts from the storecupboard and a chopped granny smith apple made a nice tart accompanimnet to the livers. I dressed this salad with extra virgin olive oil mixed with a little apple juice and brown sugar and then served it on a bed of black pudding. The potatoes were just thickly sliced and roasted until golden brown in duck fat (from the last time I had duck). The livers were simply seared until just browned on the outside. And that was it really. No need for a recipe with something so simple, and I doubt I could remember quantities anyway. The duck livers were, as I thought, similar to chicken livers but more rich with a great texture. At that price they’re a much better choice than calf liver. I’m aware that this blog is turning into a bit of a red meat -fest. I make no apologies. This phase will probably wear off when it gets warmer. Steak Bearnaise is my idea of treat food but at the moment treat food happens every time Goon visits. I really shouldn’t spoil him so much. In spite of my best efforts to get him to live like a civilised human being, Goon has reverted to eating ‘convenience’ food of the lowest order. By that I mean the sort of food that most of us would be reluctant to eat even if the only alternative was to chew off our own arm. I’m serious! He eats tinned chicken curry on pasta. Or tinned steak and kidney pudding on pasta. Or tinned chilli on pasta. You think I’m joking? I didn’t believe it until I went around there and saw his bin. Ah, well, at least he’s learned to cook pasta. Even though these poor living conditions are entirely self inflicted, I feel the need to treat him when he comes to my place and, on school nights when I’m feeling uninspired, steak bearnaise is an obvious choice. It’s not cheap and it’s not healthy but it is tasty and if the home made chips weren’t a safety issue, I could probably make it with my eyes shut. Melt the butter in a pan. .
Whisk the egg yolks in a heat proof bowl. Continue to whisk the eggs until they start to thicken, then trickle in the butter a little at a time while you keep whisking. When the sauce is smooth, fairly thick and light yellow, add the tarragon vinegar a little at a time. It pays to taste it after adding a teaspoon, to see that it isn’t becoming too tart. Finally stir in the chopped tarragon and season with salt and pepper. Take the water off the boil. The sauce can be left while you make other things but it needs to be whisked ocasionally to stop a skin forming on the top. peel the potatoes and cut into large chips. Bing a pan of salted water to the boil. Boil the chips for 5 minutes. Drain thoroughly and set aside. Rub the steaks with olive oil, season well with salt and pepper and cook on a griddle to your preferred taste. I got a griddle pan very hot, then cooked on one side for 30 seconds, turned the steak around by 90 degrees then cooked it on the same side for another 30 seconds. then I turned the steak over and did the same on the other side. Wrap in foil and keep at room temperature for about ten minutes. While the steaks are resting fill a large sauce pan one third full of sunflower oil. Heat over almost full power for two or three minutes. Keep a large plate covered with two or three layers of kitchen towel ready to drain the chips on. To test if the oil is hot enough, drop a cube of bread in. It should sizzle and go brown in anbout 1 minute. Remove the bread cube with a slotted spoon and discard. Add the chips in batches to the oil. Remove with a slotted metal spooon as they turn golden brown. Drain on kitchen towel and allow to drain completely. Serve each steak with the chips, a green vegetable and a big dollop of sauce. Garnish with extra tarragon. after several months of not being able to properly access your blog. When I finally opened up my admin page after goodness knows how long, I was pleased and slightly suprised to find some people had linked to me. Of course I was less pleased when I found they’d just been hotlinking my photos. Chuh! Then there were the forty or fifty comments largly made up by spam. Having been there when my spam filter was designed, I know that this spam isn’t made by spam robots as it used to be. There are apparently now many hundreds of trained spam monkeys trawling the internet and leaving badly disguised links to their websites, masqueraduing as gushingly complementary comments. Anyay, yes, hello, I’m back, at least temporarily. I still don’t have a real computer. Just a laptop with a screen I can barely read and no keyboard. Thank God the boredom of the Christmas holidays has finally forced me into typing on a barely functioning USB device to update this poor, neglected website. So now I can tell you about my recipe for sheep. No, of course I couldn’t eat a whole one. Not in one go anyway. But this dish includes a fair number of sheep consituents. According to Henderson, if you find a butcher worthy of your custom and let them know how much you love them, you can expect great things. In his case, he got pig trotters. I was after sonething slightly different. I was expecting a negative reaction clutching my short but unusual shopping list but the gentlemen at H G Walters barely batted an eyelid when I handed them the piece of paper. One veal kidney, some lamb sweetbreads and two lamb tongues would apparently be no problem.The two latter ingredients were destined for a recipe that held my fascination for some time: lamb rack with sauteed tongue and sweetbreads. The original recipe, from the first series of ‘The Great British Menu,’ had obviously been created in the summer and required fresh broadbeans and samphire. I made do with defrosted peas but otherwise the ideas are largely unchanged. Prepare the sweetbreads: If they’re frozen, allow them to defrost. My butchers say that if you’re short on time, let them sit it some warm water to speed this up. Then soak them in cold water in the fridge for two hours. Drain the sweetbreads. Bring a pa of water to the boil. Drop in the sweetbreads, bring back to the boil. Drain immediately and refresh in cold water. When they’re cool, peel off the tough outer membrane, then pop them in the fridge until ready to cook. Prepare the tongues: Place in cold water and brinng to the boil. Simmer until tender (around 1 hour 15 minutes). Remove from the heat and allow to cool in the cooking liquid. Roast the rack of lamb as you norally would. I brushed mine with olive oil, seasoned and roasted it in a preheated oven at gas mark 6 for15 minutes This gave me pleasantly rare meat. Wrap in foil and leave to rest. While the lamb is roasting/resting, cook the peas in boiling water then drain. Pat the sweetbreads dry and dust them with the seasoned flour. Heat half the butter in a frying pan and when it is foaming add the swweetbreads and fry until golden brown on all sides. Remove with a slotted spoon and set aside. Drain the tongues and cut in half. Sautee on both sides auntil golden brown. Add the sweetbreads, stock and peas to the pan Simmer together for a few minutes. Cut the lamb rack into cutlets and serve with the peas and sweetbread mixture. Garnish with parsely. Minted new potatoes made a good accompaniment to this. All in all a good recipe. The slighly diappointing thing for me is that the sweetbreads weret te crispy type I’ve had before. Perhaps that is easier to achieve with calf sweetbrads. Still, the flavour was good and I imagine that if I’d had a chance to get my hands on some samphire, it would have been even better. Incidentally, lamb sweetbreads are CHEAP. Excellent value for money if you have a good butcher that can order them for you. The most expensive part of this meal was the lamb rack but, given the quality it was well worth it. The internet is a funny place isn’t it? For a start, it isn’t really a place at all, although it does feel like one: a seperate world where people can quietly have a look into other people’s lives (yes, serial lurkers, I still know you’re there ). It’s a place where one can anonymously irritate and insult perfect strangers all day without getting punched in the face and, on a chatroom somewhere, a lonely guy in his mid forties can start a loving relationship with a beautiful girl in New York without knowing that in reality she’s a fat hairy man from Newcastle. I’ve heard some people say that one day the internet will be the world’s single source of information and will eliminate the need for books and television. Personally, I hope this doesn’t happen. I’m no stickler for tradition but I think there is one big problem with the net at the moment: search engines. Search engines were designed to be intelligent, but they are, for now, very, very stupid indeed. To demonstrate what I mean, let’s try a little experiment. Open a new tab on your browser (or a whole new browser window if you’re the type to have a messy desktop) and go to www.google.co.uk. Now, search for ‘how to cook couscous’. That’s right, in Google’s opinion, one of the world experts on cooking couscous is Goon. The man who the other day served up crunchy pasta in a carbonara, the man who asked me if chocolate truffles were dug up by pigs in France, the man who I recently caught trying to drink sherry soaked raisins straight from a mug, is one of Google’s top choices for advice on cooking this particular carbohydrate. Needless to say, Goon has never cooked couscous by himself. It is very, very dangerous to trust Google’s recipe choices. Of course, in reality, I love the internet. Over the last week when my access was limited, I felt like I was going slightly mad. Google is the one of the things I use the most, both for searching and for advertising on my site. However, on occasions it does frustrate me. There are days, when I have a bit of comment abuse from the internuts and I wonder why they have decided to attack me so suddenly. Generally it turns out that Google has put me top of an image search for cute fluffy bunnies and I bet you can guess which posts it links to. Then there are the occasions where Google does send people with relevant queries to my site but directs them to the wrong place. If you search for beef mince recipes (as a ludicrous number of people appear to do), my blog’s first appearance will direct you to the archive for September 2006, which is totally useless. I do have a page somewhere with beef mince recipes but that obviously isn’t relevant. Now, one of Google’s favourite pages on my blog appears to be the recipe for devilled kidneys. It was an old page, from before the great hard drive crash of Summer 2006. The picture was gone, the recipe was vague. However it was Google’s 5th hit. I was embarrassed, so I decided to spruce it up and, to make sure that Google doesn’t start sending people to the August 2008 page instead of to the right place, I’m giving it a Google boost. So, Google spiders, are you watching? This is the recipe for devilled kidneys. That’s right, a devilled kidney recipe. In fact it is a lamb kidney recipe too. You may wish to call it a deviled kidney recipe or a recipe for deviled kidneys. I think that should do it. I’m afraid you have to click on one of the links to see the devilled kidney recipe. You’ll see why. So there I was, £500 poorer, until the agents returned my deposit, looking for a place to live in the most heavy season for letting. Further flat hunting in that area proved futile because I needed a place for the 20th of August and it was already the 7th: far too late to be looking, apparently. I seriously considered going down to Putney in person to give my former landlady a big slap. Turning my hunt to Hammersmith, I was given more promising news. In a fairly well known agency I was told “We’ve got two places. A studio with separate kitchen for £960 per month and a one bed flat for £1040.” I squirmed at hearing the prices but in spite of my better judgement, agreed to have a look. The one bed flat looked much more promising. It was still being done up but it had a nice big bedroom and certainly had a decent view over some greenery. There was just one thing that confused me. “So where’s the kitchen?” The agent shuffled uncomfortably. It appeared that he wasn’t expecting me to ask this. “I DID only ask for self contained properties with seperate kitchens” I reminded him. “This does have a seperate kitchen” I looked around. “It’s enough, I’m afraid” “I poked and prodded the walls. Nope, no cupboards hidden here.”What the hell do people DO with places like this? !” “Well, there’s enough space to heat up a tin of something” he suggested helpfully. I left very, very quickly. Now this was by no means the worst flat I saw, although it possibly was the worst value for money. Apparantly, if you live in London and want to live in a single person’s/couple’s accomodation, you DO NOT COOK. That is unless, like me, you are very persistant. After much searching I did find a reasonable studio with a big kitchen and a gas hob that cost considerably less then the two places I mentioned in this post. Apparantly I was lucky. It had been on the market for around 6 hours. It took me roughly 5 minutes to put down a holding deposit. Of course, agents’ flat descriptions never give you a true indication of what a place is going to be like so, if any of you find yourself in my position, I have written a brief guide to finding a decent one person flat in London. Studio Flat: A single room with a sofa bed/pull down bed. Small studio: Really, you’re just going to have the bed. Spacious studio: You can possibly fit in a T.V and sofa. Self contained: you get a shower, toilet and ‘cooking’ facilities to yourself, you lucky devil! Open plan kitchen: One wall of the studio has had a sink and a hob fitted with a couple of cupboards and a mini-fridge. Kitchenette: You have a two ring electric hob and a sink. No kitchen cupboards or washing machine. Seperate Kitchenette. One of the corners of the room jutted out, so the landlord has put up a partition and shoved the hob and sink in there. Close to all local amenities: There’s a small convenience store/Costcutter withing 10 minutes walk. Good transport links: You are guaranteed that at least one bus stops less than 5 minutes away. Close to tube: Your location has increased your rent by approximately £200 per month. Start approximately 4 weeks before your proposed move in date. Any earlier and your offers are likely to be rejected because you can’t move in soon enough. Any later and all the places have gone. Don’t bother looking online. The market moves so fast that the listings are constantly out of date. Get down to where you want to move and talk to the agents in person. Well known and respected estate agents rarely give you any bullsh*t. The little independant ones are a lottery. If a place seems inexpensive but is near a tube station, be prepared for it to be rubbish. If the place has just been put up for rent by someone who used to live there, don’t be too suprised if they decide to move back in or sell it instead. Things are far more stable if the property has been let before. And, yes of course I do have some food for you… comfort food of the highest order from my point of view. I was still budgeting when I took this flat, but after having such a grueling day, Dad, who’d been looking at flats with me gave me £10 to treat myself and Goon. He’s very sweet like that. So I popped down to Borough the next day to try out a recipe I’d had in mind for ages. Make the puree by boiling the watercress in well salted water for about 5 minutes. Add the spinach leaves and wait until they have wilted completely. Drain and squeeze as much water out as possible. Process the leaves with the cream until you have a very smooth paste. You can add more cream if you like to make it into a sauce. Brush the steak with olive oil on all sides, season and cook to your liking. Sautee the girolles with the garlic in olive oil until soft, stir in the parsley, cook for about another minute. Serve the steak with the mushrooms and watercress puree. We had some steamed broccolli as a side dish. As you might tell from the ridiculous close up of this dish, I found this ridiculously hard to present well. Why? Because the sauce was GREEN. I don’t mean the nice dark forest green that Mr Ramsay somehow managed to produce for his book but bright, bright green. When Goon decided he wanted to have his sauce as a pouring sauce and I added more cream, it was positively luminous. Despite being a little ‘colourful’ this was a nice relatively simple way to serve steak. The sauteéd girolles were gorgeous and the pureé was good, full of flavour from the peppery watercress but with the the spinach coming through with almost equal strength. Providing you process it for long enough, the pureé will have the perfect texture:absolutely silky smooth. So in short, I certainly recommend this in terms of flavour but it possibly isn’t one to try for a dinner party. These steaks are from Farmer Sharpe’s in Borough Market. They turned out to be a bit less expensive than those from my usual butcher and had a noticeably different flavour and texture. These Galloway cattle give a very ‘beefy’ steak (if that makes any sense) with a strong flavour that reminded me a little of buffalo. I recommend trying them out if you get a chance. Calf liver is my treat for when Goon is away. It’s an automatic reaction now. If Goon is going away to work on his business or visit his parents, I head straight into Borough Market, find my way to the Ginger Pig and buy myself the nicest bit of veal liver they have. You see Goon isn’t a big liver fan. He can cope with chicken livers providing I soak them in enough cream and alcohol, but he hates lamb liver and is ambivalent about calf liver. At £25 per kilo, ambivalent isn’t allowed! So calf liver is reserved for the days when I have the flat to myself. My problem is I always buy the liver without knowing what to do with it. Last weekend I was after a change from the usual creamy marsala sauce but the internet was providing little inspiration. In fact, the recipe websites seem alost saturated with straightforward liver, bacon and onion recipes. That’s not quite what I wanted for my treat! Eventually an idea came from an old BBC recipe. 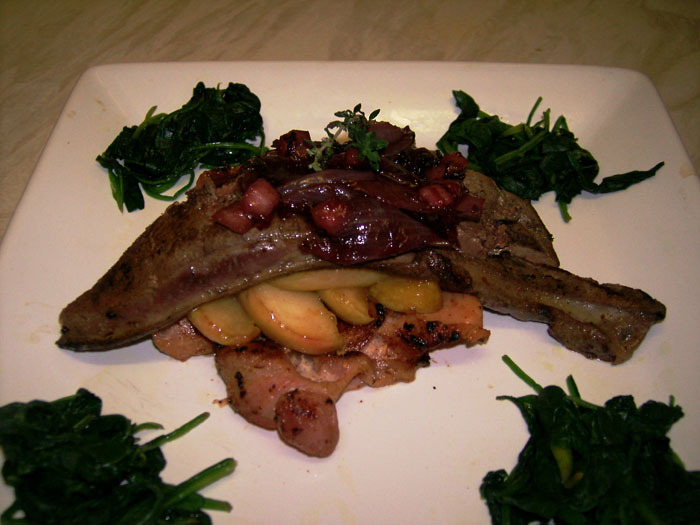 A liver, bacon and onion recipe by Gary Rhodes involves serving liver with melting onions with marmalade. A bit of musing led to the recipe below. Unfortunately, due to the great Islington juniper shortage that hit last weekend, I didn’t sprinkle my calf liver in finely ground juniper as intended. Instead, I dusted it with 1 juniper berry I had left, after giving it a good soak in gin. Then I gave my own liver a good soak in gin. Happy times. Sprinkle the liver with finely crushed juniper berries and press them in properly (or soak it in gin!). I suggest the calf liver is cooked to pink in the middle. For the liver you see in the picture, that involved dry frying for approimately 30 seconds on each side and resting for 5 minutes wrapped in foil. Melt 3/4 of the butter over a low heat in a small saucepan and stir in the honey. Add the rosemary sprigs and allow to infue for a minute or two. Add the apple slices, sir to coat in the butter. Turn the heat up slighty so the apples caramelise. They should be golden brown on the outside, but firm. Discard the rosemary sprigs before serving. And for the onions, the only involved part of the meal, soften them in the rest of the butter until golden brown, add half a glass of red wine, allow to bubble down until almost completely evaporated then stir in a tablespoon of apple sauce. Add balsamic vinegar to taste- this will depend very much on how sweet/tart your apple sauce was. Calf liver has a delicate flavour compared to, for example, lamb liver, so you don’t want the onion to be overwhelmingly tart, just slightly tangy. I doubt you’ll need to add sugar but it is probably worth having some on hand just in case. I served this with some simple buttered wilted spinach but spiced braised red cabbage would also be good. I first had kangaroo steak a couple of years ago at Archipelago, near Russell Street. This is an excellent restaurant which has a very original menu. However I think I did badly with the kangaroo dish, it was a touch overspiced and so I didn’t get chance to taste the meat properly. I tried it again a couple of months ago in a Walkabout pub. They do several kangaroo dishes. I opted for a salad and it was very good. Since then I’ve found places to buy this meat online. Osgrow and Alternative Meats both stock this as well as a wide variety of other exciting things. Gamston Wood who have a stall at Borough Market but, sadly, no website, sell Ostrich and Kangaroo and I am informed they will be expanding their selection soon. Kangaroo has a very similar flavour to venison and there isn’t a huge difference in price. Half a kilo of a good quality steak cost me about £11 - about the same as an off the bone venison haunch. I had been told it went well with berry sauces so after a bit of internet research and looking at the special offers in the local supermarkets, I came up with this recipe. The idea for the sweet potato came from The Amateur Gourmet. It doesn’t look like he’s put up a recipe so I’ve offered mine.